The Painted Table tells the story of three generations of a Norwegian family who settled in the US. The table was handcrafted in 1800s in Norway and made its way to Minnesota to the family of Knute Kirkeborg and his wife Clara. Knute’s father had painstakingly carved it and sent it to him. The table passes on to Knute’s daughter, Joann. To her it symbolizes many traumatic childhood memories. 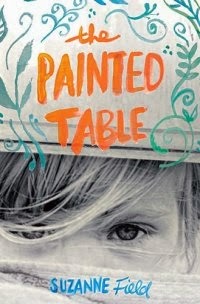 Joann keeps painting over the table as she struggles with her past, and tries to fight the mental illness passed on to her from her mother. Watching her mother suffer and seeing how much the table seems to bring pain, Joann’s daughter, Saffee, grows to hate what has become an ugly painted table. Saffee however, attempts to break the cycle of pain and seek redemption. In this, her first novel, Suzanne Fields has created a gripping tale of how painful memories and mental illness can hold families for generations. The emotions are raw and one really hopes the story will end on a note of hope. I won’t give the ending away. However, suffice to say that the book kept me wanting to read and find out how the story ended. I love the issues the story dealt with – family legacies and family secrets – how we can choose whether we will allow them to hold us down or to move towards healing. I received a free copy of this book for review via Litfuse Publicity. Nice review Corinne. From the gist it looks like an interesting book. Nicely written review. You ignite an interest to read. The wooden Norwegian table brought to mind the song “Norwegian Wood” by the Beatles (So you lit a fire – to read this book – isn’t it good Norwegian wood). Sounds like a powerful story Corinne. Any story that brings mental illness and mental health issues to light is an important book. You’ve made a compelling case to pick this book up. Thanks for your suspense-filled review – I’m curious how this family story ends. I read the post a while back. Getting chance to comment now. It is a beautiful plot. We have always read books where family heirlooms are pride or objects of love. this is so different. And come to think about it why not?They do reek of certain legacies we may not like or love… A beautiful read I am sure..
That seems to be a nice book. ‘Family legacies and family secrets’ exciting! Raw emotions.. as I read your review, Corinne, I got the feeling that only a brave heart can read this book. The emotional content, especially if its heavy on the sadder part.. is very tough to read for me. I am chiding myself about the 20 unread books in my collection… Like blogging, even books have somehow taken a back seat as I struggle with long hours at office. A good review, however, since you conveyed the gist in as few words as possible. This is a must read for me. I know others with mental illness, and this book is completely relatable. Thanks for sharing this review! Thanks for the review. It sounds like a moving story and reminds me of how beautiful things can become repugnant when associated with trauma or painful experiences. A very interesting and a different story! Must check it out sometimes! Sounds interesting! Adding it to my Goodreads To-Read 2014 challenge! What a great premise for a story! Sounds like an interesting book, Corinne. And I like the glimpse you offered!